The Deluxe Edition took the "old reliable" Handy Rotary series to new heights in component quality. Photographs of actual aircraft replaced the drawings used in the original books. Figure 13. Cardstock game cards with aircraft silhouettes serve as play aids. Figure 14. A sturdy bookcase style box replaced the old slipcase. But all was not rosy (despite the pink gamebook cover.) The cockpit views depicted in the Deluxe Edition gamebooks are smaller than in the original books. In addition, the word "experimental" stenciled just behind the cockpit of the Fokker Triplane is clearly visible in the photos (a consequence of using a Dr. I that was still being flown out of the Old Rheinbeck Aerodrome in New York.) To add insult to injury, this blemish looks even worse on views to the left rear quarter of the Triplane: the image was simply flipped from the opposite view so "experimental" is shown backwards! A second graphic failing is the box cover. Figure 12. While the cover art is rather attractive, there is not much good that can be said about it from a historical standpoint. At first glance, the allied aircraft appears to be a Nieuport 17 in British markings. However, the cowl and cockpit area have the look of a Sopwith Camel. The German aircraft appears to have had some cosmetic surgery as well... perhaps a creative mechanic had grafted a Fokker D VII tail onto a Fokker Triplane? But fortunately these are minor quibbles next to the fine improvements made to the rules and play-aids. The Deluxe Edition rules are better organized than any prior edition. The rules still offer varying levels of complexity: Introductory, Standard and Advanced. There are also rules for a Campaign game. For the first time in the series, the complete rules were printed in a separate rulebook rather than being squeezed into the gamebooks. Figure 15. The play-aids make the Deluxe Edition Advanced game much more user-friendly. The capabilities of different aircraft and the aces who flew them are reflected on the data reference cards. Figure 14. The end effect is to make for an easier transition from the basic to advanced game levels. The potential of the game system to realistically represent aerial combat without overly burdensome game mechanics really shines through in this edition. Upon opening this version of the Deluxe Edition, one might wonder why some of the components are too large for the box. It turns out that some of the components came from the British release printed by Emithill Ltd. According to Greci, the Emithill release used European standard sizes for paper and this ended up being a bit too large for the boxes printed for Nova in the U.S. The origin of the pink and red gamebooks is noted on the last page of each where the notation "Printed in England" may be found. Publisher: Nova Game Designs, Inc.
2. One 8-1/2" x 11" sheet with the six steps for basic play. 3. 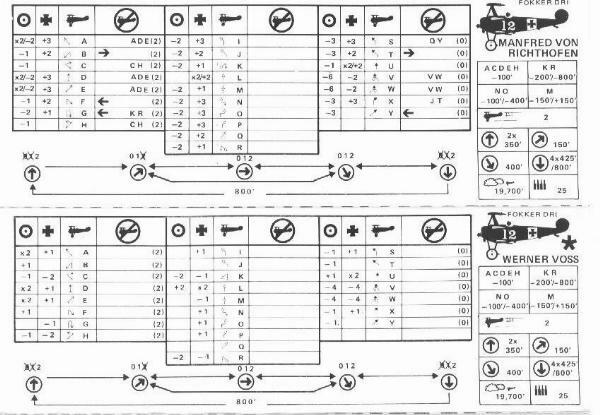 Two 2-3/4" x 4-3/8" Pilot Sheet cards. * Components marked with an asterisk were printed in England by Emithill Ltd.
a. Matte box finish like typical game box. Except for the cosmetic differences as noted below, this is the same as the previous edition. Dennis Greci cautioned that the various types of components found in this and the previous variation may have been mixed differently at one time or another as component supplies were depleted. However, other copies of the matte and glossy box Deluxe Editions which I reviewed also contained the respective components outlined here. 3. One 8-3/8" x 11-5/8" two-sided sheet of Pilot Sheet forms. 6. Six 8-1/2" x 11" two-sided Aircraft Data Cards. 7. One 8-1/2" x 11" glossy Aircraft Data Card, card stock with pre-creased fold lines. b. "Nova 2495" printed below bar code in lower left corner on bottom of box. Wingleader is the World War II incarnation of the Ace of Aces system. Although the basic system used in the original World War I editions could have been dressed up into a superficial World War II game with only cosmetic changes, this was clearly not the approach taken in Wingleader. Wingleader came in the same sized box as the Deluxe Handy Rotary edition. The cover art is a dramatic painting of a North American P-51 Mustang climbing up to attack the belly of a smoking Focke-Wulf FW-190. Figure 19. The same type of aircraft are depicted in the gamebooks using photographs taken from inside and outside the respective planes! Figure 20. However, the benefit of using photographs is completely offset by their appearance. The Wingleader photographs, best described as "dot matrix printer" quality, are highly inferior compared to the photographs in the Handy Rotary books. The rules and play-aids in Wingleader retain the feeling of air combat from the earlier games while introducing a better feeling for the limitations of a maneuvering aircraft. It is no surprise that Wingleader is the favorite Ace of Aces edition of both Alfred Leonardi, the designer, and Dennis Greci, listed in the credits as a playtester. The rules are broken down into Introductory and Basic sections along with a few Optional Rules. 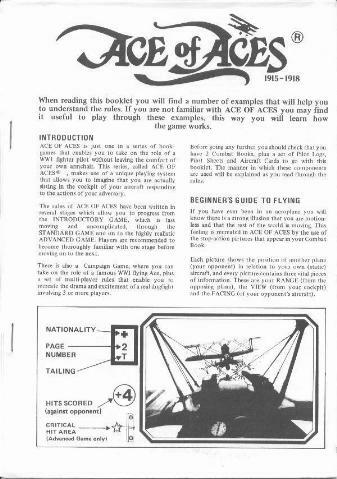 There is also a "Beginner's Guide to Flying" for those new to the Ace of Aces system. 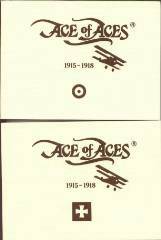 The basic Ace of Aces design is still recognizable and the introductory game is instantly playable as in previous editions. Unfortunately, the rules are a bit abbreviated which might make this a difficult starter game for those new to Ace of Aces. Also, the critical hit rules present in the World War I games are regrettably absent. The innovation which really sets Wingleader apart from its predecessors in the series is the use of Aircraft Cards. Figure 21. 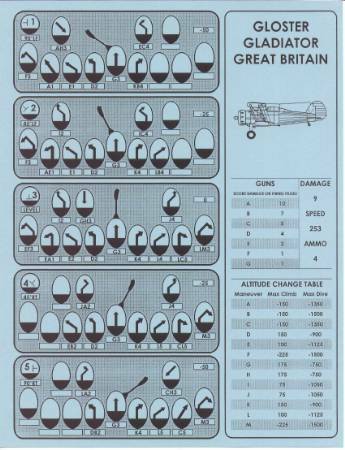 Charts on each card define the capabilities of the twenty four different aircraft which may be flown in the game. An aircraft's possible maneuvers are limited by one of five different bank attitude displays on the chart. Although there are only thirteen maneuvers on each page of the Wingleader gamebooks, the system allows for complex maneuvers using "maneuver formulas" on the Aircraft Cards. In addition to the maneuver information, the Aircraft Cards also contain data for an aircraft's ammunition supply, maximum speed, ranged gunfire damage, and maximum climb/dive during various maneuvers. Although the abstract handling of these details may not satisfy hyper-realism freaks, the Aircraft Cards definitely serve to give a distinct feel to the various aircraft. An errata sheet is found in later editions. This corrects a few errors and explains what the "Ammo" number is supposed to be used for. Figure 24. 4. Two different colored 5/8" diameter plastic discs. 5. One 5-1/2" x 8-1/2" rules booklet bound with two staples. 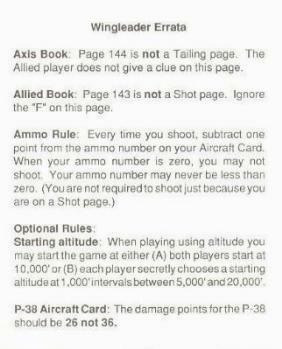 a. Chessex edition with additional aircraft and campaign game rules described below. b. Some copies may include an errata sheet? The Wingleader Expansion Set was a special addition to games distributed by Chessex Manufacturing. The expansion was added at the time that Chessex acquired Nova's inventory. Dennis Greci estimated that there were approximately 500 of these sets. A brief review of the Expansion Set shows that it is a "must have" for Wingleader players, if only for the twelve new aircraft cards (which add another 24 aircraft to the game.) Also included are campaign game rules, designed by Alfred Leonardi and Greci, which allow for large scale tournament games. There are also two suggested Speed Bonus rules for dealing with combat between aircraft of varying maximum airspeeds. With the exception of the variations listed below, all attributes and components of "Deluxe Wingleader" are the same as previously listed for the regular edition. Box: 9-1/4" x 11-1/2" with painting of a P-51 Mustang pursuing a smoking Focke-Wulf FW-190. Chessex sticker on front and back of box. Shrinkwrapped? 4. One 2-1/2" x 3" ziploc baggie containing two different colored 3/4" diameter plastic discs. 6. 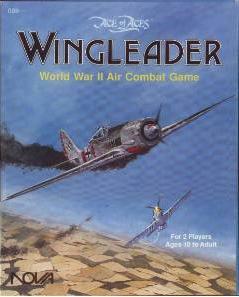 Fourteen 8-1/2" x 11" white sheets of rules and counters titled Wingleader Expansion Set. a. Chessex sticker in upper left corner of lid. b. Chessex sticker covering Nova's address on back. As might be expected, the Ace of Aces system feels somewhat out of place in the era of BVR (beyond visual range) combat. Although Jet Eagles attempts to build on the design concepts of the Wingleader edition, it does not make the historical leap as successfully as the previous edition. Although the components are very similar to Wingleader, they feature two crucial improvements. First, the rulebook is clearer and more comprehensive than Wingleader. Second, the gamebook photographs (featuring an F-15 Eagle and MiG-29 Fulcrum) do not have the "dot matrix" look. The Jet Eagle gamebooks actually combine photographs and drawings. While the opposing aircraft is depicted with a photograph, the cockpit (including a radar screen inset and HUD messages) is depicted with a drawing. The combination works to good effect. Individual aircraft statistics are again contained on Aircraft Cards. Figure 25. Information contained on each includes ammo capacity, gunfire damage by range, radar lock-on capability, countermeasures, ceiling, missile loads, and other statistics and modifiers applicable to the aircraft. In addition, each card has an array of 70 boxes for maneuvers. 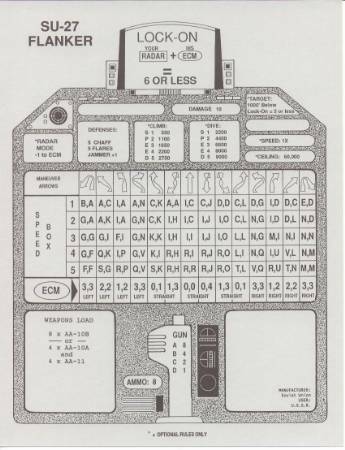 The layout of the cards creatively mimics the appearance of a jet fighter cockpit, even including a HUD and control stick. 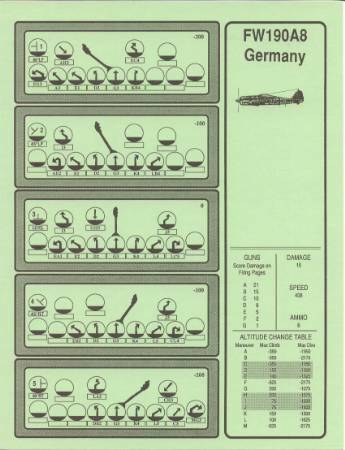 In addition to using the Aircraft Card during play, each player also has an Instrument Panel Card which contains charts and data necessary for play. Each player also has a missile card which gives the statistics for the various air to air missiles. Needless to say, there is a lot more to think about in a game of Jet Eagles. This makes for a challenging and enjoyable game. However the missile combat mechanics are a bit stilted. Aircraft maneuvering is stopped while the missile is maneuvered in an attempt to hit the target and only the target aircraft maneuvers against the missile. If the missile misses, a new starting page is selected from a table based on aircraft speed. These mechanics, unfortunately, throw a monkey wrench right into the basics of the Ace of Aces system. I see Jet Eagles as Designer Alfred Leonardi's noble attempt to bridge one era too far. Jet Eagles is a fun game to play, and I do recommended that Ace of Aces fans give it a try. 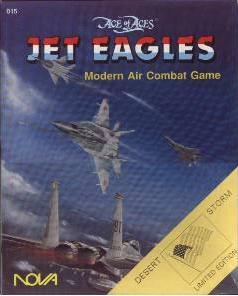 However, I cannot recommend it to those looking for a reasonably accurate recreation of jet fighter combat. 7. One 8-1/2" x 11" rules booklet bound with two staples. The Desert Storm Limited Edition was released in early 1991 to coincide with the flag waving accompanying the conflict in the Persian Gulf. 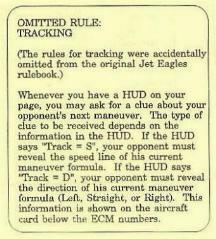 The expansion added four additional aircraft, a few new rules, and restores a tracking rule omitted from the original rulebook. Figure 27. Although labelled a Limited Edition, it should be noted that this edition seems just as easy to find today (if not easier) than the standard edition of Jet Eagles. All attributes and components are the same as listed for regular edition of Jet Eagles with the exceptions noted below. 8. One 8-1/2" x 11" two-sided sheet with map, rules and corrections for Desert Storm edition. 9. Two 8-1/2" x 11" two-sided buff card stock Desert Storm edition Aircraft Cards. a. 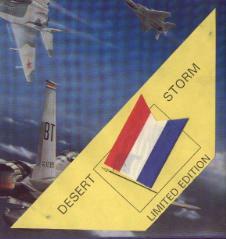 Some copies do not have a ribbon on the Desert Storm label. Dennis Greci related that this was because someone forgot to put the ribbon on one production run. A caveat on the following two editions: since these were assembled from 'spare parts' during the time that Nova Games was being disbanded, the component listings should be taken as merely representative of what might be included in other copies of these editions. I have coined this unusual 'spare parts' set the Richthofen edition because it includes the instructions from the British printing of Ace of Aces which refers to the Fokker Dr. 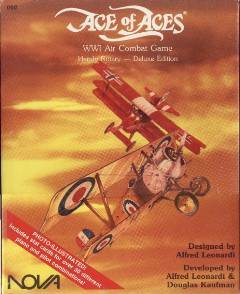 I vs. Sopwith Camel book set as "Richthofen." Figure 29. According to the person I got this set from, it was purchased from a Nova booth at a gaming convention in the 1980's. The components appear to be a mixture of the British edition and domestically produced components. For the most part the contents of the Richthofen edition are similar to those found in the Handy Rotary Deluxe set using the Emithill Ltd. components. However, the aircraft data cards have a matte finish and are slightly smaller than those found in either boxed deluxe edition. Dennis Greci of Nova Games explained that around the time Nova closed down there was still quite a bit of inventory left. Although they had run out of Deluxe Edition boxes, there were still plenty of books, slipcases and other components. He assembled "a small quantity" of these spare parts editions using the surplus slipcases and believes they may have been sold at one of the last conventions before Nova's demise. Publisher: Nova Game Designs, Inc./Emithill Ltd.
2. One 2-3/4" x 4-1/4" Pilot Sheet card. 4. Six 12" x 8-1/2" sheets of rules folded stapled together with two staples on the left side and then folded in half. 5. Thirteen 8-3/8" x 11-3/4" matte finish Aircraft Data Cards, card stock with pre-creased fold lines. This is the second 'spare parts' set I have run across. Dennis Greci informed me that approximately 60-80 of these were created when Chessex picked up Nova's old inventory. He stated that "Nova had closed by this time and prior to Chessex picking it up, I was selling off inventory to distributors and hobby stores in any format that I could . . . just to empty my garage and workbench at home." 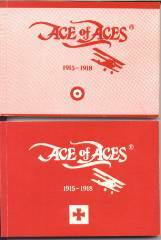 This edition included a very abbreviated 'cut and paste' photocopy version of the Deluxe Edition rules, a set of domestic Deluxe Edition photo illustrated game books, and an insert that read as follows: "THANK YOU for buying this special basic edition of ACE OF ACES. Please note that, in the enclosed rulebook, there are references to a number of components which are not included with this basic set. These components are available with the deluxe boxed edition, or separately by mail for $6.95..."
3. One 3-1/4" x 8-1/2" sheet with offer for additional components.